A luxurious Yoga Holiday in a beautiful Eco Resort in the heart of Goa. Meditate, stretch, relax, read, unwind. 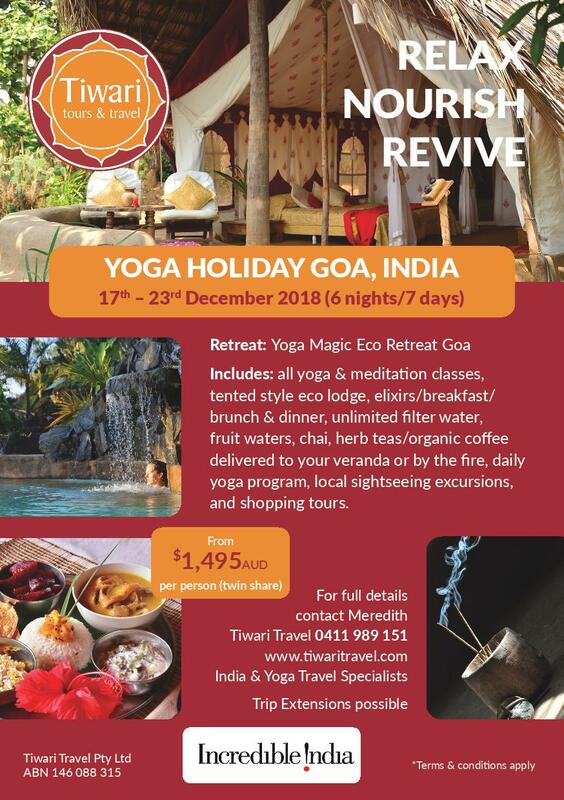 …Staying at Yoga Magic, quite simply one of the most unique, luxurious eco yoga retreats in India, offering the ultimate in back to nature tranquility.…..
*This daily program is optional and may change.. Guests may choose to follow this program above or simply relax in their room there is no obligation to follow the programme though it is recommended. A nourishing blend of Krishnamacharya Yoga Madniram, Vini yoga, vitalising slow flows, Iyengar inspired, Sivananda, Yin, Restorative and Hormone Yoga Therapy, Philosophy talks before lunch Mondays and Fridays. Classes are for everyone at all levels. Resident Yoga teachers will take you on yoga journey. Each teacher brings a different element and style complimenting each other. Guests new to yoga will receive personal lessons to get them started. Are equipped with yoga mats, bolsters, cushions, bolsters, straps and wooden blocks, flowers, candles & incense. So no need to bring your own. Delicious, nutritious and varied vegetarian menu is served with vegan and gluten free options. Organic where possible and home grown from garden. 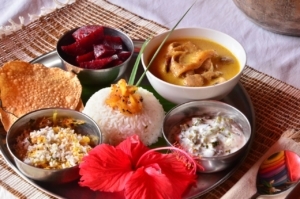 Cooking is based on Vedic principles, to produce a wide variety of fruit, vegetables, herbs, spices, salads and healing plants. Mornings begin with masala chai, organic coffee or garden teas of lemon grass, galangal and tulsi served on your veranda or by the fire place from 7:15am. An abundant spread of tropical fresh fruits, homemade muesli, buffalo yogurt and preserves, local honey and oven made sourdough breads, alongside an array of Indian breakfasts and Mediterranean /middle eastern dishes, and of course organic farm eggs! Super salads with everything one can imagine. Dressing, cheeses, traditional dhal, rice, fired papad, pineapple chutneys, raitas and toasted buckwheat poi. The gong sounds at 7pm, inviting you to eat as much as you like from wholesome dhals, tasty curries, cooked with organic spices, chutneys, roti’s, salads, rice, raitas, and scrumptious desserts. Narelle is joining us on the Yoga Goa Holiday and will be available to everyone for treatments personally in your own rooms. She has over 36 years working in Naturopathy, shiatsu massage, nutrition, kinesiology, Chinese and Japanese acupuncture, mobibustion, cupping, herbal medicine and Face Reading. She is available for treatments throughout the holiday. Narelle will be offering Face Reading. Discover how to love yourself by understanding your complete face. This face is a mosaic of your entire life. By understanding your nose, eyebrows, shape of face, size of ears, hairline etc. we get to know our gifts and talents and challenges.